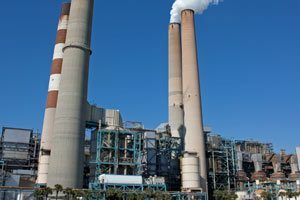 Electrical power infrastructure facilities in the United States are at high risk for terrorist threats, both to physical facilities and data control centers. When it comes to vulnerability to potential sabotage by terrorists and malicious intruders, transformer substations, power distribution facilities and remote, unattended installations are of special concern. Protecting those sites with high security perimeter fences is the first line of defense. When CIP-014 standards go into effect, electric power companies will be required to install fences that meet those standards. Ameristar has created its Matrix perimeter enclosure grid system with those standards as the basis for its engineering. This adaptable and expandable design lets you implement a security perimeter that will be able to meet the highest standard. The Ameristar Matrix system is designed with a modular framework that supports a variety of grid panels. Designed for efficient, fast installation on 8-foot centers, the framework is assembled with security fasteners from the secure side of the fence. 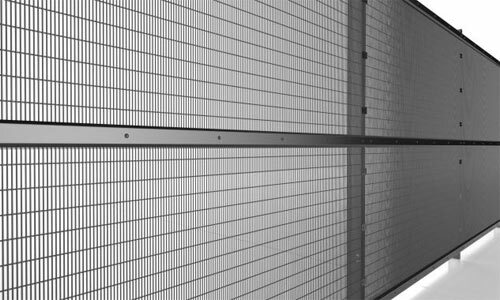 A selection of grid panels, let you select the relative visibility through the fence and resistance to cutting that best suits your requirements. 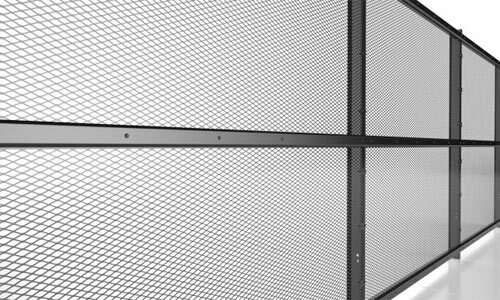 From WireWorks welded mesh panels, which offer maximum visibility, to X-Screen expanded mesh panels that have maximum anti-cutting qualities, the choice is yours. You’ll also be protected by a 10-year warranty, something chain-link fences can’t offer. 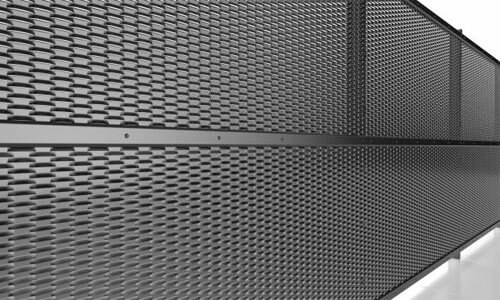 Depending on the grid panels selected, Matrix fences meet ASTM F2781 forced entry standards. Unlike traditional chain-link fences, the Matrix grid system has outstanding resistance to cutting with hand and power tools. Its most resistant mesh materials stand up to the most aggressive threat level and passes tests easily. Intruders are stopped cold. In addition, the mesh grid design is also virtually unclimbable. Fence heights available range from 8′-6” to 20′-6”. Security fasteners are designed to thwart removal from the exterior of the fence. Rails and panels are covered to prevent prying. Threat detection systems, video monitoring and other communications are essential, particularly at remote installations which are unattended. The Matrix system framework includes open rails that serve as races for electrical cables as well as anti-ramming steel cables. Rail covers can be added to conceal and protect all wiring and cables. Posts include pass-through ports to allow continuous wiring. If additional wiring and cables are required, conduits on the inside of the fence can be protected with optional ballistic resistant plates that meet UL 752 level 3, 6 and 8 standards. Electric utility facility fencing must be properly grounded. The grounding system for Matrix grid perimeter fencing meets IEEE grounding standards with all connections concealed by design. As a fence with a high-tech powder finish coating, it also meets aesthetic requirements and blends better with surroundings than traditional galvanized chain link fences. Ameristar offers eight levels of Stalwart anti-ram systems that can be integrated with the Matrix perimeter enclosure system. Stalwart’s cable-based anti-ram technology meets DHS Safety Act certification standards. This protects the company from liability and the Stalwart anti-ram system has been thoroughly tested and proven. Ameristar has designed the Matrix product line for simplicity of installation and enhancement without the use of excessive numbers of additional fasteners or brackets. All components can be installed from the secure side of the fence. Security fasteners are designed and located to prevent removal from the outside. 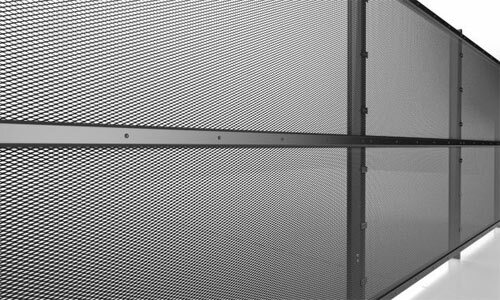 The cutting-resistant powder-coated mesh panels are installed with fasteners only on the secure side. Channel covers on the secure side prevent exterior access to video, intrusion detection system and other cables. Installation requires a minimum of workers and the engineered simplicity of design speeds the process. Ameristar’s engineered Matrix grid perimeter fence system is an ideal solution that provides unmatched security for electric utility infrastructure installations. If your organization is planning to upgrade security fencing for new or existing substations, transformer stations, distribution centers or any other facility, whether attended or unattended, Ameristar’s Matrix system sets a new standard that lets you match your precise needs with a cost-effective solution. Contact us today for expert assistance in creating a complete materials list for your new installation. We will be happy to arrange for fast direct shipping to your location from the manufacturer at economical pricing.